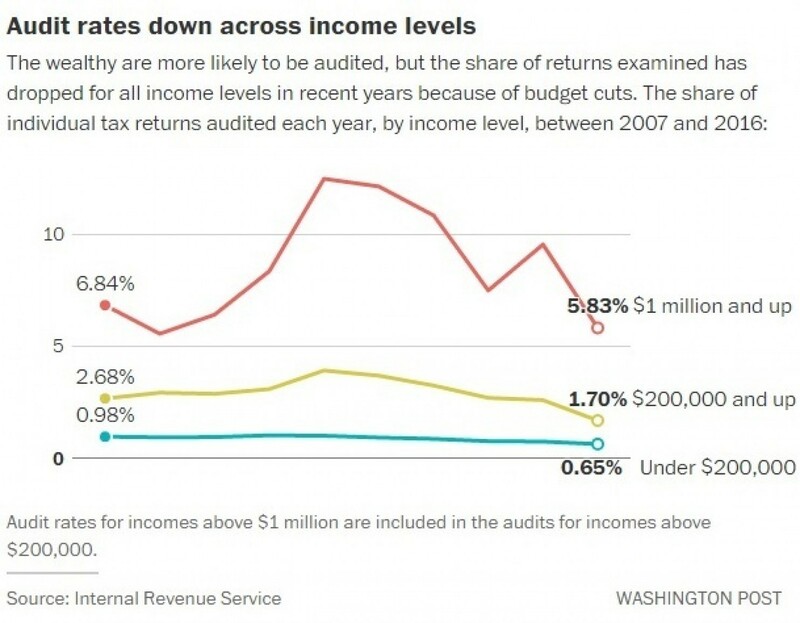 New data from the beleaguered Internal Revenue Service shows that the agency audited barely more than one million individual tax returns in 2016, the lowest number since 2004, according to an analysis by The Washington Post. The number of audits dropped by 16 percent from the previous year, marking the sixth consecutive year of decline. The IRS is reeling from a proposed 14 percent cut in their operating budget for the coming year, and says that its tax enforcement and audit operations are in their sorriest state in more than a decade. Long under attack by GOP lawmakers on Capitol Hill – especially since the agency admitted targeting conservatives for tax scrutiny in the 2012 election -- the IRS in recent years has been forced to make significant cutbacks in audits and tax compliance operations. That in turn has led to widespread tax cheating and major revenue losses for the U.S. Treasury. Last year, the IRS reported a jaw-dropping $458 billion average annual difference between taxes that were owed and actually paid, a 5.5 percent increase. Now the new Trump administration has targeted the agency for an additional 14.1 percent budget cut in fiscal 2018 as part of a government wide drive to slash spending to help pay for a $54 billion increase in defense and national security. The new report may be the IRS’s way of making the case to the White House budget office that another round of operating cuts would be foolish if the government is serious about going after tax scofflaws.